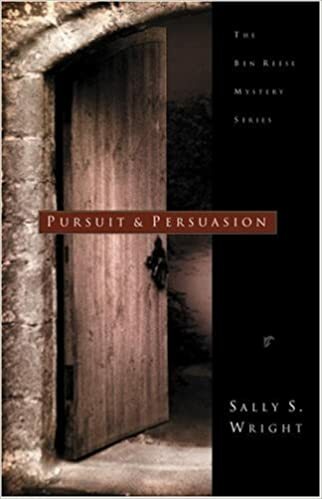 The sixth book in Sally Wright’s Christian but not preachy Ben Reese mystery series is a prequel. 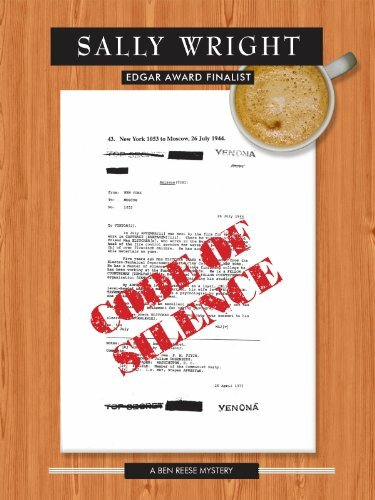 In Code of Silence, we get to see Ben – university archivist and former World War II Army scout, in 1957, handling his first civilian mystery. We observe him enduring the wrenching loss of his wife in childbirth, and watch as his friend Richard West looks about desperately for some project that will help Ben re-engage with the living. That project appears in the form of a letter and a package from Carl Walker, a man Ben barely knew. Nevertheless, Carl knew something of Ben’s background, and sent him a letter, books, and the key to a code. Ten years before, Carl had been in love with a linguist who worked for American intelligence. She died, and it was marked down as suicide. Carl was certain that she was murdered by a Russian double agent. Carl knew who the man was, but lacked sufficient evidence to prove it. Now the man has reappeared, and Carl has disappeared. Suffering from both grief and a head injury incurred early in the story, Ben is nevertheless drawn into the mystery. Before it’s over it will become more than an intelligence cold case, but a race for life to save two innocent people. I think Code of Silence was my favorite of the entire Ben Reese series to date. Ben’s an interesting character, and the story is suffused with moral indignation over the very real acts of treason performed by a number of known American traitors during the 1950s. Cautions for mildly intense scenes involving torture. Highly recommended. I find, as I work my way through Sally Wright’s Ben Reese series of mysteries, that I enjoy the books that center on Ben himself most of all. Watches of the Night, the fifth of them, set in 1962, is one of those. Ben is having some trouble at work as the story starts (after a flashback to World War II). His university’s integrity-challenged new president is putting pressure on him to collude in an illegal act. His immediate boss, the chief librarian, is aiding and abetting the president. Meanwhile, in Scotland, Kate Lindsay, a widow to whom Ben is attracted, receives a shocking package in the mail. It’s the eye of her late husband, killed nearly 20 years before in combat. Ben is planning a trip to Europe on archive business anyway, so he agrees to talk to her. Little do they know that they’re uncovering the secrets of a powerful, ruthless man, who will stop at nothing to keep his past covered. Before they’re done there will be murder and Ben will face a nightmare out of his own past. 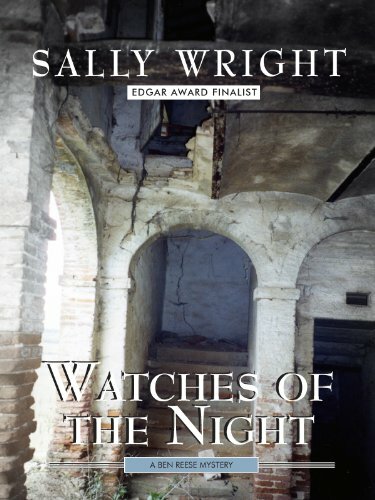 I was particularly impressed by the treatment of war scenes in Watches of the Night. One doesn’t expect (because “one” is a famous sexist) that a female writer will handle battle situations well, but I found those parts in this book (and there are many in flashbacks) extremely good. Also Ben’s and Kate’s cautious courtship passes a milestone this time out, which is nice. Mature themes, but no profanity. Recommended. 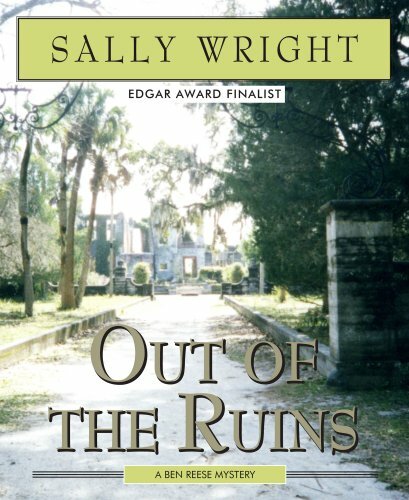 Book four in the Ben Reese mystery series by Sally Wright is Out of the Ruins, a venture into Southern Gothic. In this episode, archivist Ben has returned to his university in Ohio from Scotland, but is taking some sabbatical time to travel to the South, to evaluate a collection of art being donated to his school. While there he gets a call from an old friend named Hannah Hill, who owns a large estate on Cumberland Island, Georgia. Hannah suffers from MS, and is confined to her bed. She is concerned about local attempts to acquire her estate for development, or for a national park. Also, she has had “dreams” about a masked figure coming into her room at night and spraying things with a spray gun. By the time Ben arrives, Hannah Hill is dead, apparently of pneumonia. Most suspicious. He enters a world of old family feuds, greed, and hypocrisy, in which Hannah’s heir – a young female opera singer – is the target of long-simmering, murderous hate. Out of the Ruins was not my favorite book in this series. I found the action of the climax kind of hard to follow. And author Wright, though generally a good writer, has one bad habit that annoys me. When writing telephone conversations, she employs what I call “TV phone call writing.” You know how it goes on TV – you only hear one side of the conversation, so they have to have the character on screen repeat everything the character on the other end says, even though people don’t do that in real life (Bob Newhart did some great comedy routines in that format back in the ‘60s). There are only two ways to handle phone conversations in a novel, in my opinion. Either leave the reader uncertain about what the unheard party is saying (this could be useful in a mystery), or just give us both sides of the conversation. But Out of the Ruins was generally entertaining, and I enjoyed reading it. Recommended. This is more like it. I was a little disappointed in the previous novel in Sally Wright’s Ben Reese series, thinking it overly complex and hard to follow. Pursuit and Persuasion is much better, as my personal taste runs. Georgina Fletcher, a Scottish scholar and heiress, has died suddenly of a stomach ailment. No one expected her to leave her entire estate to her student assistant, an American named Ellen Winter. Equally unexpectedly, she left a letter behind for Ellen, telling her that if she (Georgina) should die suddenly, for any reason, she was to engage a private investigator to look for evidence of murder. Ellen turns to her former college advisor, Ben Reese, who is still in Scotland in the wake of his previous murder investigation. Ben finds that, although Georgina was a well-liked person, she did have enemies – an accountant who disapproved of her (generous) business practices, and neighbors who object to the changes she’s made in the family estate, among others. Before he’s done he’ll learn of an old family crime, hidden obsessions, and an attempt to right a very old wrong. He’ll also come into imminent peril of death. I had fun with Pursuit and Persuasion. The plot wasn’t as complex as in the last book, and the cast of characters was less confusing. Most importantly, the focus was mostly on our hero, Ben himself, who is an interesting figure. A couple romantic possibilities turn up to raise the human interest of the exercise. And the Christianity of the story is never in doubt (although the book opens outside the Eagle and Child pub in Oxford, author Wright resists the temptation to give either C. S. Lewis or Tolkien cameo roles). Highly recommended. Suitable for most readers. 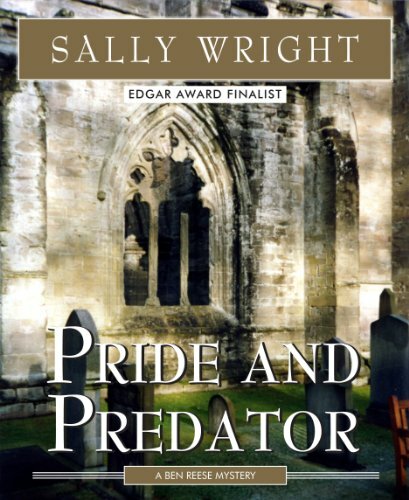 Sally Wright’s second Ben Reese novel, Pride and Predator, takes our American archivist hero to Scotland, where he gets involved in a classic “cozy” mystery. Jonathan MacLean, a minister of the Kirk of Scotland, is found dead on the island of Lindisfarne (famous in Viking lore, though that’s not mentioned here), killed by an allergic reaction to a bee sting. The fact that he was carrying a picnic basket, in which dead bees were found, is suspicious, as he had never before carried a basket on his walking trips. And it’s hard to imagine who would have wanted him dead. He was a popular pastor, beloved by his wife, friends and family. He possessed no great riches, though he had inherited a title. A few people disliked him, but not murderously. As he uncovers the truth, Ben will find himself working against time to stop a killer before he kills again. 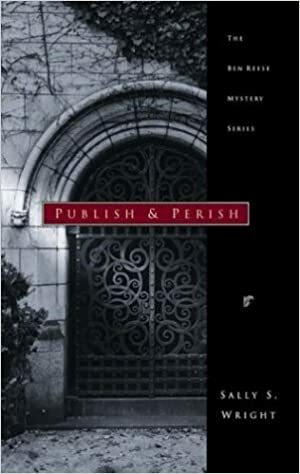 I liked the first book in the series, Publish and Perish, very much. I have to say I was less taken with this one. The cast of characters seemed to me huge, and almost all of them had Scottish names. I had a lot of trouble keeping them straight. There also seemed to be a lot more talking than strictly necessary, and the plot was convoluted. Still, cozy fans will probably enjoy it (I myself like cozies if they’re well done), and the language is decent and the values Christian. Moderately recommended. Ben had never felt a conflict between the two and he doubted that Richard had either. Any more than either one of them had seen a conflict between reason and revelation. I linked to an article about Sally Wright a couple days ago, and said I was reading one of her novels. I am delighted to report that author Wright has sailed past my critical misogyny to make me an immediate fan. She writes a pretty good male hero, in the tradition, I would say, of Dorothy Sayer’s Lord Peter Wimsey (though Ben Reese is a very different kind of character). In Publish and Perish, first novel in a series, Ben Reese, World War II intelligence veteran, is an archivist at a private college in Ohio. The year is 1960. He is in England doing research when he gets news that his dearest friend has died of a sudden heart attack. Ben (who is his friend’s executor) rushes home to deal with the aftermath. He is disturbed by certain puzzling circumstances surrounding the death, and the local police chief agrees with him. Ben starts asking questions, and someone else dies, and then Ben himself becomes the target of a murder attempt. We often complain about the poor quality of Christian literature. Sally Wright’s work is a shining example of the sort of thing we’ve been pleading for. The writing is superior, the characterizations and dialogue polished and entertaining, the mystery satisfying. And the tone of the thing is appropriate both to Christianity and to the time period – there is no, or very little, obscenity. The Christian characters talk like human beings, not tracts, and the values are unashamedly old-fashioned. I enjoyed Publish and Perish immensely, and look forward to reading the rest of the series.